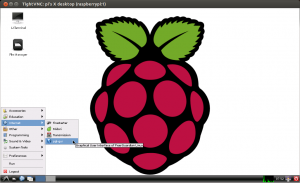 This tutorial will show how to compile and install Peer Guardian on a Raspberry Pi. The process requires the at least the 2012-06-18-wheezy-beta.zip or newer Debian image (or manual kernel re-compilation). This will NOT work with debian6-19-04-2012.zip since the kernel does not have net filtering enabled. Also, you will need a decent sized SD card (4GB at least) … the dependencies alone require 382 MB. Note: this takes much longer than usual for the first boot, be patient! The default settings are very strict and you will likely want to change them. It even blocks access to the apt sources, so until you changes the settings, even ‘apt-get update’ will fail. I wanted to point out, that it’s possible to compile pgld 2.2.1 without installing qt4 (gui stuff, setting sysconf dir is recommended) first run “./autogen.sh” then “./configure –without-qt4 –sysconfdir=/etc” – “make” – “make install”…. then according to /usr/var/log/pgl/pgld.log I had trouble with “Cannot initialize D-Bus …. org.netfilter.pgl” due to security policies in the configuration file.” – to fix this issue copy /usr/local/etc/dbus-1/system.d/org.netfilter.pgl.conf to /etc/dbus-1/system.d/ (cp /usr/local/etc/dbus-1/system.d/org.netfilter.pgl.conf /etc/dbus-1/system.d/). Thanks for the tip Michael! The GUI is overkill and unnecessary for most applications I’ve run so far anyway! Hmmm… not a very useful error message. What is the output of the two files that Peer Guardian suggests to check for more detail? I got got errors running those commands too. I installed all the suggested dependencies except the two with qt4 in their name into a new non gui installation of Raspbian that only has xbmc and mpd installed on it. Thanks, very useful for an Orange Pi also. How do you check if pgld is running? ?